The Background To "Duty Dodgers"
Duty at the rate of 6d per Troy ounce was first laid on English silver plate by an Act of 1719 entitled "An Act For Laying A duty On Wrought Plate" which came into affect on 1st. June 1720. The important feature of this wording is that it applied to ‘hallmarked’ plate so that in order to avoid paying this tax some silversmiths avoided having their plate hallmarked. 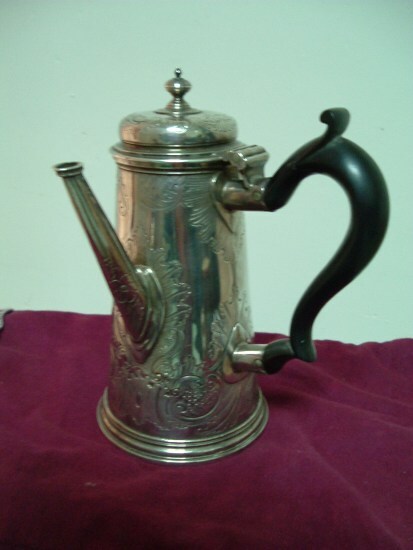 Some, like the famous Paul de Lamerie, just didn’t bother to have marks of any sort applied to some of their plate and there is even now quite a substantial amount of silver plate in England of this period which is just unmarked. 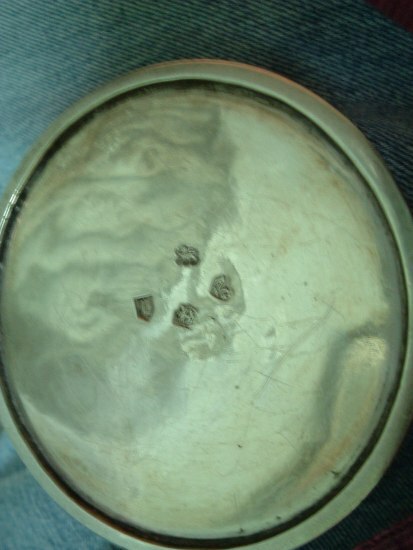 Other silversmiths merely struck their own makers’ marks several times in order to simulate hallmarks but there were those who found ways to ‘hallmark’ their plate fraudulently. The commonest way in which this fraud was perpetrated was by transposition. Transposition is the practice of cutting out the marks from old or small plate and soldering them into new plate and although the penalty for this offence was a fine of £500.00 or, later, transportation, the practice seems to have been fairly widespread. Items of plate exhibiting this fraud are known as ‘Duty Dodgers’. So widespread did the practice become that the Goldsmiths’ Company of London, having some responsibility for applying the law regarding all wrought plate, decided to take steps to overcome it and to clarify their own position with regard to it. They elected a committee of their own members, including de Lamerie, to draw up a Bill to lay before Parliament which would make clear exactly what was required of their members with regard to hallmarking and exactly what charges they could impose for this service. The Bill would also make clear what penalties would be imposed for infringement and would clarify which items of plate would be exempt. 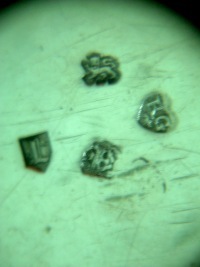 The matter of the form to be adopted for makers’ marks would also be clarified. So comprehensive were the results of their endeavours that they became the ‘principal of hallmarking law in England until 1975’ (J.S.Forbes-HALLMARK- A history of the London Assay Office- p201). The findings of this committee were put before the House of Commons in February 1738 but did not get onto the statute book before Parliament was prorogued. Thus, although what became ‘The Plate Offences Act’ is dated 1738, it was not until 1739 that it became law. 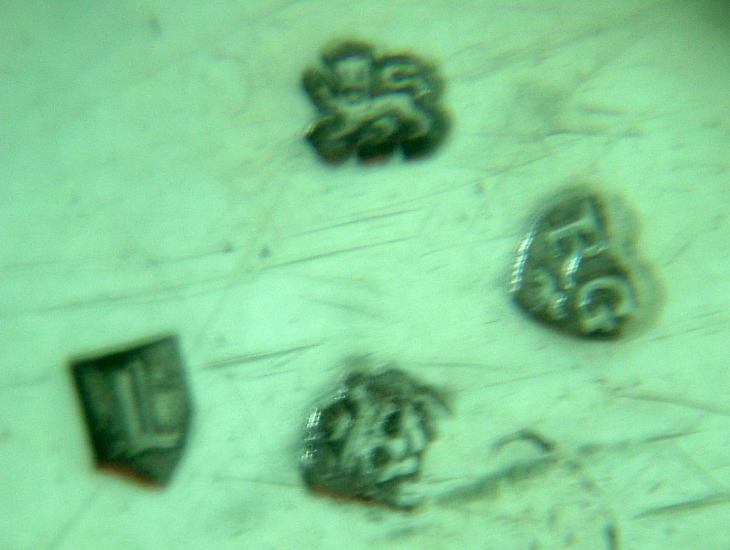 So far reaching would be the affects of this new law that the Goldsmiths’ Company decided to mark its introduction by altering the form of all their hallmarking punches. This would normally have been done at the beginning of the marking year which throughout the 18th century (and in fact until 1975) was the 29th May or a day either side of this date. In fact the Bill was not expected to become law until the first week in June 1739 and the changing of the date letter in that year was therefore postponed until 8th June. In the event the Bill did not gain the Royal Assent until 14th June and, being unwilling to delay further, the Company went ahead and introduced the new date letter, the lower case letter ‘d’, on 6th June but without altering the outlines either to the date letter punch or those of the lion and leopard. Thus the date letter for the beginning of the 1739 marking year appears in a Norman ‘Heater’ shield as it had done, with the exception of ‘K’ and ‘M’ for the years 1725 and 1727 which are in square outlines, since 1561. It was not until 18th July that new distinctive punches were produced with indented outlines and these outlines remained in force until the end of the 1755 marking year (27th May 1756) so that transposition of these marks can be easily identified if the style of a piece of plate on which they are struck does not fit with this date span. The marks on the base of the coffee pot shown in the November newsletter are a mixture of a pre 1739 date letter, with its heater shield outline, and 1739 to 1755 lion and leopard with their indented outlines and thus the pot is easily recognisable as a ‘Duty Dodger’! Apart from getting involved in legislation regarding Duty Dodgers, The Goldsmiths’ Company also took its own practical steps to overcome the problem and these resulted in the introduction of mechanical marking, but that is another story.